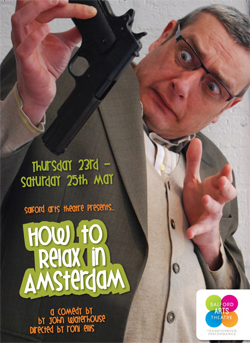 If you fancy a great night out at the theatre, to indulge yourself with a good old fashioned comedy, complete with outrageously over the top characters; well you don’t want to miss out on the latest play by John Waterhouse, currently on at the Salford Arts Theatre until Saturday 25 May 2013. Relaxing in Amsterdam tells the story of recently divorced Peter, who after meeting Saskia on holiday in Andalucia, decides to ‘pack up his troubles’ and arranges to stay with her for a few weeks at her apartment in Amsterdam. If sightseeing and reading were what he had in mind, then he gets a lot more than he bargained for on this trip! Not long after he arrives, pictures of Peter robbing a bank are splashed all over the local news! Hmm not helped by the fact that Saskia’s would be boyfriend is a policeman!! What ensues is an extremely funny and well scripted play that just flows effortlessly. Yes, the accents are over the top, and yes most of the characters are too, but that is what is so good about this play. It’s like ‘Allo, ‘Allo meets a good old fashioned comedy farce. The characters are likeable, and believable and above all it is fun. This was the first night and there were a couple of hiccups with the props and just a couple of fluffed lines but the way the cast handled these were great – they just ad-libbed to incorporate this, turning it into a natural smooth continuation of the play. The audience laughed and appreciated these little deviations, much better than trying to ignore it and I think it is testament to the cast that they felt relaxed and confident enough to do this. This is the second play by John Waterhouse that I’ve seen, the first being ‘How to Relax in Andalucia’ which I saw back in July 2012 which introduces us to Peter & Saskia amidst murder, mayhem and kidnapping – not what Peter had planned when retreating to this quiet hotel in Andalucia. I must point out that by no means do you have to see ‘Andalucia’ first – these are two completely separate and standalone plays! Both extremely witty and above all entertaining.